An executive says the age of exchange plan enrollees is about what the company had expected. (Bloomberg) — WellPoint Inc., the second-largest U.S. health insurer, has increased its 2014 earnings forecast. Net income this year will be greater than $8.20 a share, WellPoint (NYSE:WLP) said in a statement today. 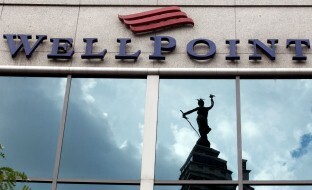 Earlier, WellPoint had said only that earnings would be more than $8 per share. Securities analysts have given Bloomberg estimates with an average value of $8.39 per share. WellPoint expects the new Patient Protection and Affordable Care Act (PPACA) public exchanges and other PPACA programs to increase major medical plan enrollment by 1 million to 1.3 million this year. The company reported in January that PPACA had helped it add 500,000 members since the individual exchange “qualified health plan” (QHP) open enrollment period started in October. “We’re very optimistic as to where we are” on the exchanges, said Ken Goulet, a WellPoint executive vice president, said today at an investor meeting in New York. The average age of the new QHP enrollees “came in right where we expected it to be,” Goulet said. WellPoint will also continue to seek membership growth in the goverment’s Medicare and Medicaid programs, Chief Executive Officer Joseph Swedish told the investors. “There’s an explosion in the government business,” Swedish said. Swedish, who took over at WellPoint in March 2013, announced the sale of the company’s 1-800 Contacts and Glasses.com units on Jan. 7, just 18 months after his predecessor bought the eyewear business. At the time, he said he wanted to focus on “core growth opportunities,” including the new insurance exchanges. “We’re simpler, focused, and value-driven,” Swedish said today. –With assistance from Phil Serafino in Paris.